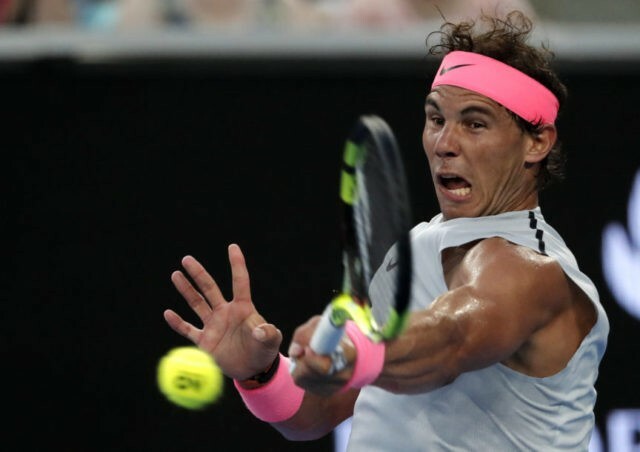 MELBOURNE, Australia (AP) — The heat wasn’t a factor for Rafael Nadal this time against Damir Dzumhur, despite the searing temperature causing trouble for players earlier Friday at the Australian Open. Nadal reached the fourth round in Australia for the 11th time with the 6-1, 6-3, 6-1 win, and leveled his career head-to-head record with Dzumhur. His fellow French Open champion Jelena Ostapenko followed Nadal’s match on Margaret Court Arena but didn’t make it through to the second week, losing 6-3, 1-6, 6-3 to No. 32-seeded Anett Kontaveit. The seventh-seeded Ostapenko’s loss left only two major winners in the women’s draw — and only one of them can reach the fourth round. Five-time major winner Maria Sharapova and former Australian and U.S. Open champion Angelique Kerber are playing each other Saturday. Nadal had lost his only previous meeting against Dzumhur, when he had to retire because of heat-related issues in the third set at Miami in 2016. It was also a change of scenery for Nadal, who was playing on the No. 2 venue at Melbourne Park while local hope Nick Kyrgios beat Jo-Wilfried Tsonga in a night match on the main court. Actor Will Smith had a prime position in the crowd to see Kyrgios win for the first time on Rod Laver Arena, taking the last five points in the tiebreaker for a 7-6 (5), 4-6, 7-6 (6), 7-6 (5) victory. Kyrgios, aiming to be the first home-grown winner of the Australian men’s title in 42 years, will next play third-ranked Grigor Dimitrov. Nadal’s fourth-round match is against No. 24 Diego Schwartzman, who beat Aleksandr Dolgopolov 6-7 (1), 6-2, 6-3, 6-3. The youngest player in the tournament and the oldest player in the men’s draw went out earlier on Day 5. Fourth-seeded Elina Svitolina ended 15-year-old Marta Kostyuk’s run with a 6-2, 6-2 victory. Andreas Seppi withstood 52 aces from 38-year-old Ivo Karlovic for a 6-3, 7-6 (4), 6-7 (3), 6-7 (5), 9-7 win in 3 hours and 51 minutes in the afternoon. Players were bothered and spectators clamored for shade and mist-spraying fans in searing heat earlier Friday, and organizers were on the verge of enforcing the tournament’s extreme heat policy before temperatures dropped significantly after peaking at 40 Celsius (104 F) around 2 p.m. local time. She got some support from Nadal, who said the conditions were “very, very tough” but the Australian Open wasn’t the only tournament affected by high summer temperatures and at least it wasn’t humid. Kyle Edmund overcame Nikoloz Basilashvili 7-6 (0), 3-6, 4-6, 6-0, 7-5 in 3 ½ hours on an open court in the peak of the heat, earning a spot in the next round against Seppi. No. 10 Pablo Carreno Busta beat No. 23 Gilles Muller and will next play No. 6 Marin Cilic, a 7-6 (4), 6-3, 7-6 (4) winner over Ryan Harrison. Kostyuk entered the tournament ranked No. 521 and opened with a win over 25th-seeded Peng Shuai, becoming youngest player to win main-draw matches at the Australian Open since Martina Hingis in 1996. The step up to facing a top 10 player was too much. Kostyuk, who had nine double-faults — including one on match point — later joked about the defeat when asked later what she could take out of the 59-minute experience. Svitolina will next play Denisa Allertova. No. 19 Magdalena Rybarikova had a 7-5, 3-6, 6-1 win over Kateryna Bondarenko. Petra Martic celebrated her 27th birthday with a 6-3, 3-6, 7-5 over Thai qualifier Luksika Kumkhum.